This discussion was created from comments split from: Solar setup help.. I have set up two 100 watt solar panels in parallel, running into a 30 watt control box using one 12 v deep cel sealed battery with attached 1100 watt inverter. when I turn on the inverter ( with nothing plugged into it), the battery drains and the controller shuts down. However, when hooking inverter directly to the battery, it registers and holds at 13:4 volts. What is happening here or what am I doing wrong? I don't know what solar charge controller you have, but if you are plugging the AC inverter DC input into the Solar Charge Controller's "output"--That is usually not a good idea. And most charge controllers only have around 8-20 amp LVD output (low voltage disconnects). And remember, if you are starting a large motor, the inverter can draw upwards of 2x rated input current (~246 amps). And, can you tell us a bit more about your inverter... A very efficient AC inverter draws something like 6-20 Watts (0.5 to ~2 amps @ 12 volts) just to turn on. And some less efficient inverters can draw 20-40 Watts or more. 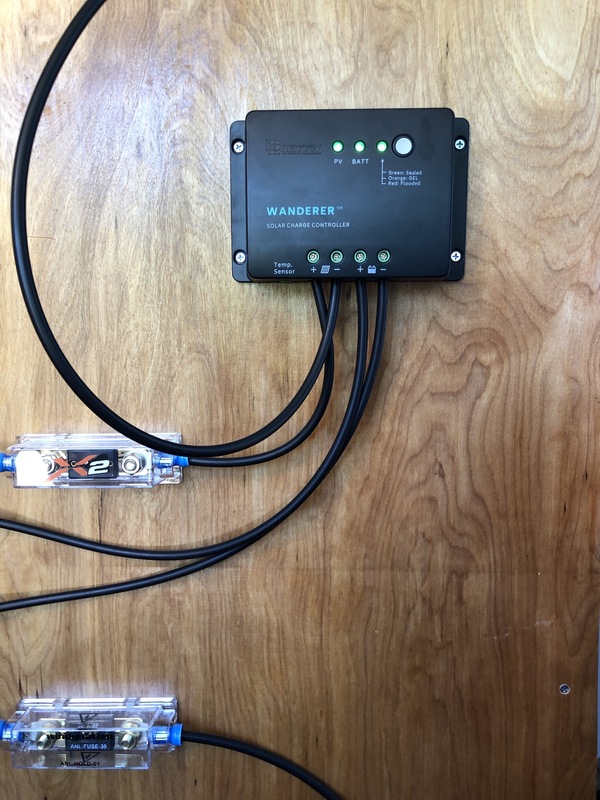 In general, the correct place to connect your AC inverter is directly to the Battery Bus (usually with a circuit breaker or fuse to protect the wiring against short circuits). Can you tell us a bit more about your system? Battery bank AH capacity, solar charge controller and AC inverter name/models, and what you want to use the system for (backup power, camping, running tools, etc.)? Is the "30 watt control box" actually a charge controller, or could it be a 30w load controller, or ?. It may help to know exactly what it is, and how it's wired. 200w of panels and a 30w control box ? How can you expect a 30w box to control 200w ? perhaps it's a nomenclature problem. Maybe it's a 30A charge controller ? 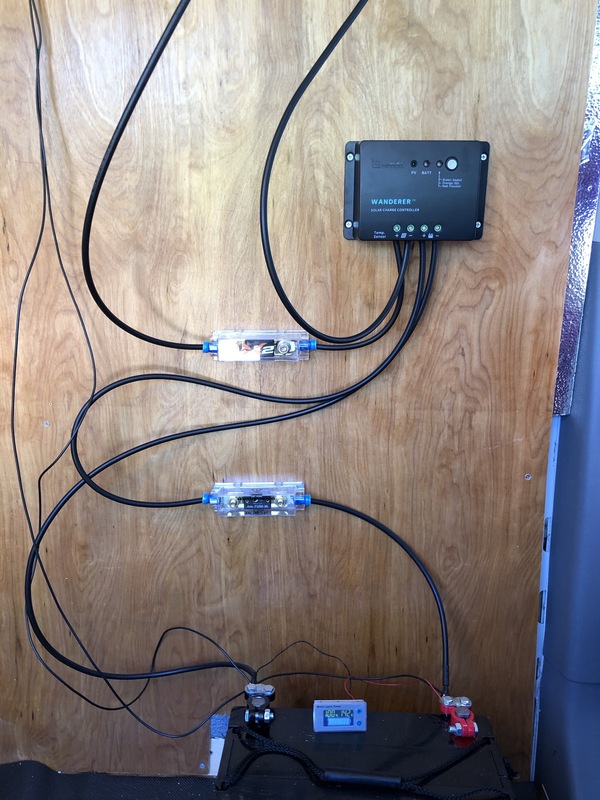 2 100 watt renogy solar panels connected in parallel connected to a 30watt charge controller (also renogy) in turn connected to 12v deep cell sealed battery (agm 100AH). out going connections are connected to the battery. Inverter KR1100 (Kreiger) connected directly to battery terminals and nothing else. All connections on battery are made to dual terminal post connections. When inverter is hooked to this, it blows everything and drains the battery. When inverter is hooked directly to another battery, it show voltage at 13.4v and holds. What am I doing wrong? What do you mean by "It blows everything"
Sounds like you are either using a defective battery or are connecting the battery incorrectly. Ok blows everything isn’t the correct terminology. The inverter is connected correctly to the battery. Pos to pos. Neg to neg. when the inverter is turned on, it registers 13.4 v and rapidly goes down to 10v (about 3secs). I hear a pop or snap if you prefer, the inverter turns off, the charge controller turns off and the battery is discharged. When the charge controller is reconnected it shows the battery is discharged and nothing is charging at that time. Unconnected the battery and charge with charger and start again. I’ve done this with 2 batteries. I know that this is damaging to the battery and don’t want to do it again. Would it have anything to do with the connections or wiring? It sounds like the battery(ies) is not any good. Or at the very minimum is pretty much zero state of charge. Can you tell us a bit more about your battery (flooded cell/sealed)? Its Amp*Hour capacity? Or BCI battery size? To recharge this battery, it needs to be brought back up to 14.2 to 14.8 volts (depending on type of battery, temperature) and held for 6-8 hours before the battery is 100% charged (if it will take a charge). 13.4 volts is "floating"--Basically just keeping the battery from self discharging. Is the controller positive or negative ground (I think they make both)? Are any grounds connected (panel, battery, loads)? To repeat, the battery is a sealed deep cel marine battery. AGM 100AH. The panels are in full sun daily. There are no grounds connected. 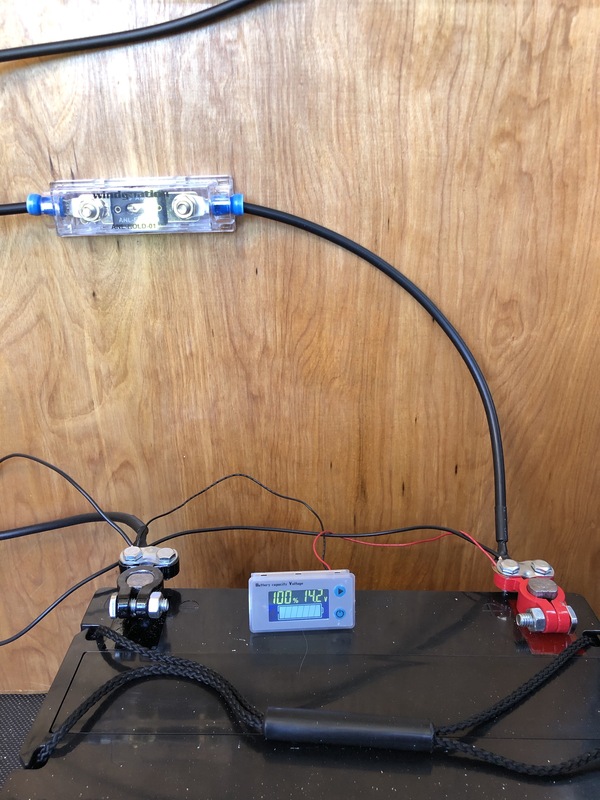 If the batteries where in good shape and held at 14.5 volts (or even reached 14.5 volts), then to discharge the bank to 10.5 volts or less in a few seconds--That would suggest that drawing 100's to 1,000 amps of current... Not just drawing 2 amps. If your wiring is too long, too small of diameter, bad electrical connections, etc., you could have a "wiring issue" -- But it does not sound like it (assuming you are measuring the battery terminal voltage). Longer term, you might want to get a DC Current Clamp type Digital Multi-Meter to help you figure out how much current is flowing in your system when charging and discharging.... Since you have sealed cells, you cannot use a hydrometer. Normally, for a 200 AH @ 12 volt battery bank, I would be suggesting around a 250-500 Watt maximum AC inverter. A deep cycle lead acid battery bank cannot really reliably supply much more energy than that for more than a few minutes at a time. But since your inverter is apparently drawing the bank "dead" with no AC loads, it really sounds like failing battery bank (why it failed, is another set of questions). The battery I have is a 100 AH. The wires, however, are quite long at this time. So you think shortening them may help? Was planning to shorten once I got the darn system working. Both batteries I have tried were brand new and fully charged. I don’t mind buying a smaller inverter but I want to use it to do more than charge my phone. Plus, are you telling me that, thru the inverter that I will only be able to use it for a few minutes? I’m quite confused now. - confirm the battery is connected to the controller BATT terminals, not the load terminals. - confirm BATT terminal connections are made first, and pv panel connections after. I assume you haven't fused the inverter to battery connection (it appears a fuse and holder are included with the inverter?). I'm a bit confused by your statement in first post "However, when hooking the inverter directly to battery", it works. In a later post, you mention a "dual terminal post connections". I assume you mean a battery connector like this? So there's a positive from controller, and a positive from inverter going to the above dual terminal on the battery positive, and likewise for negatives to battery negative? The above numbers are very rough--But close enough to give you a good idea of why using a relatively large AC inverter to charge a small cell phone is not the most energy efficient method. The specs say that is draws only ~0.5 amps @ 12 volts (0.5a*12v=6watts)--That is actually very low Tare Loss for an 1,100 Watt AC inverter. The only other reason I could see it working on one "good battery" and failing on another "good battery" is if you got the + and - Lead reversed (connected the AC inverter "backwards" to the battery). Some electrics use a "diode shunt" across their DC input to protect against connecting things backwards. If you were to connect the AC inverter backwards, the diode inside the inverter shorts out the battery bank and pops a fuse or circuit breaker. 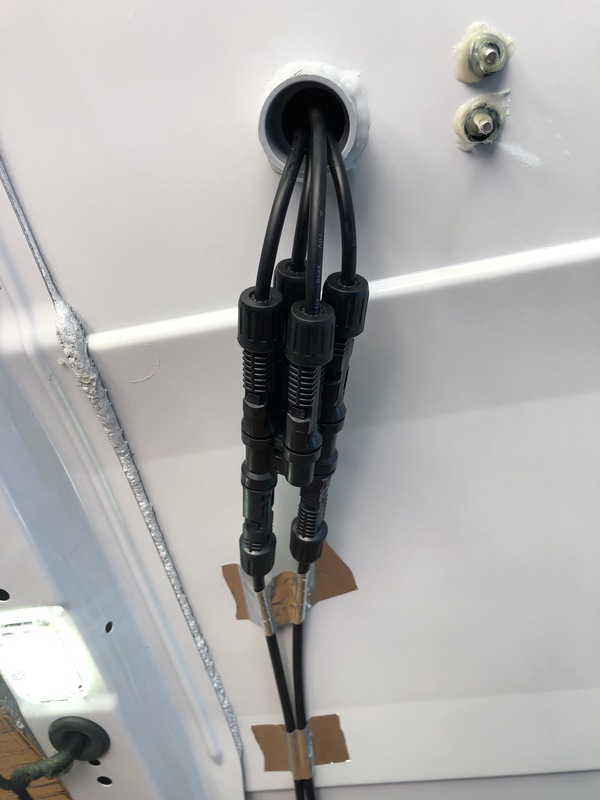 One other generally "warning", you have to really use bolted up electrical connections to connect your AC inverter to the 12 volt battery bank. If you, for example, just try to use automotive jumper cables, there is a good chance the inverter will not even start (jumper cables do not make a "good enough" electrical connection). Also, this is (I think) an MSW (modified sine/square wave) AC inverter... There are "grounding issues" with most MSW AC inverters (do not wire your MSW inverter into a household breaker panel)--MSW inverters do not "like" their AC output with a "grounded bonded AC neutral/white wire"... It creates a short circuit between the "ground referenced" AC output back to the ground reference DC negative battery bus (if you are using grounds in the system). Do you have a wiring diagram you can post? And/or a photograph of your battery+inverter wiring? I think their is a disconnect between what you are doing, and what we think you are doing. Some drawings*&pictures could help. What are the thinner (12ga?) wires going to the battery for? I see a pair of thick (8ga?) black wires going to the controller, and a red and a black (16ga?) apparently going to the meter sitting on the battery, but can't see where the two slightly thicker black ones go. Something above and to the left of the controller? I still need help before I have to call someone to pay to help me. I have another inverter coming this Friday. Maybe that will make a dif. Otherwise I just may throw in the towel. The setup looks OK... And the 14.2 voltage when charging is correct for a sealed lead acid battery. The exhaust fan should have a 2-3 amp fuse (or so, depending on the fan) to protect that wiring against shorts. Also, how much power does the fan draw, and how many hours a day do you run it? If you run even a small fan 24x hours per day, it can use most of the energy harvested from your solar panels. Can you show a picture of how you are connecting the AC inverter? The cables are a bit long... It is better to run them side by side and short/direct runs side by side for the +/- cables (bundle tie together). But, I don't see them as being a cause of the problems you are having. If the battery voltage (as measured at the battery terminals) is dropping that quickly (a few seconds with the inverter just "turned on" and no AC loads--It would seem that you have a bad battery. I also don't see any obvious problems with wiring that would account for your problem. As Bill noted, the fan should be fused (the meter too, for that matter), but that wouldn't solve your problem. Since the inverter apparently works when connected to another battery, Bill's notion that the battery has lost capacity seems quite possible. Do you know the amp draw on the fan? Does it drain the battery faster than expected without solar? Either that, or a bad/shorted connection to the inverter. As mentioned earlier, taking a good, fully charged, 100ah battery down to 10v cut-off in a matter of seconds takes a lot of current. Enough that I'd expect something to get pretty hot in the process.